Mega Sale! 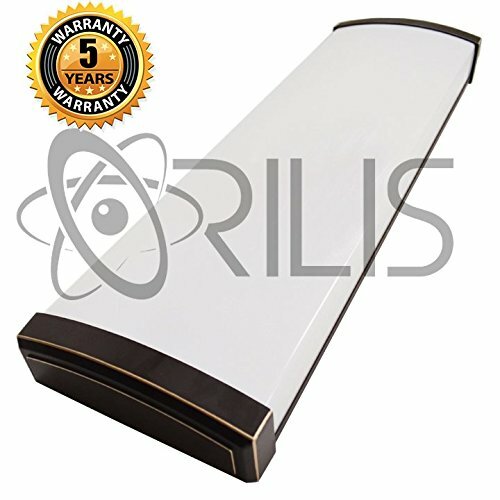 Save 28% on the Orilis Elegant Oil Rubbed Bronze 4 ft. 2-Light 48W Decorative Wraparound Flush Mount Ceiling Light Fixture with 6,000 Lumens - 6500K - 2x 24W LED T8 Tubes - Replacement for (4) 32W Fluorescent Bulbs by Orilis at The Synthesizer. Hurry! Limited time offer. Offer valid only while supplies last. 5 YEAR WARRANTY!!! This is an Orilis elegant oil rubbed bronze surface mount fixture with a set of (2) LED T8 24 Watt Bulbs included (48W Total). 5 YEAR WARRANTY!!! This is an Orilis elegant oil rubbed bronze surface mount fixture with a set of (2) LED T8 24 Watt Bulbs included (48W Total). This wraparound fixture has an inner metal cover to hide wires. These LEDs are 30% brighter than the standard 18 Watt LED bulbs. The fixture uses a frosted, prismatic acrylic lens with oil rubbed bronze end plates to provide widespread illumination. These bulbs work as an Eco-friendly and cost efficient replacement for (4) 32 - 48 Watt (128w- -192w Total) Fluorescent T8 bulbs. This fixture requires no modifications at all. All of the necessary conversions have been completed. Mounting hardware is included. Best LEDs on the market! If you have any questions about this product by Orilis, contact us by completing and submitting the form below. If you are looking for a specif part number, please include it with your message.